Bandai Namco has announced that a day-one DLC will launch alongside the upcoming First World War adventure 11-11: Memories Retold when it launches days before the centennial of the November 11, 1918 armistice that brought an end to the Great War. A portion of the proceeds from the DLC will be donated to War Child UK, a charity relief organization that helps children and teenagers living in conflict zones today. 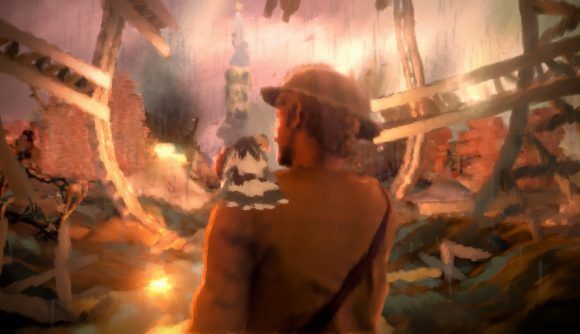 11-11: Memories Retold is an “emotional journey” through the trenches of World War I, and it’s a collaboration between French indie studio DigixArt and British animation studio Aardman, beloved for their popular Wallace and Gromit series. It features a distinctive painterly art style, and the voice talent of Elijah Wood, who plays war photographer Harry Lambert. The War Child DLC adds the story of two children, Jack and Eva, who players will learn about through additional in-game collectibles like letters and photographs. Their story is inspired by the true stories of children War Child UK has made it their mission to help out. “Through their words (taken directly from written testimonies from children affected by war around the world), we are exposed to the fear, uncertainty, and painful realities of war,” War Child explains on its official site for the collaboration. 11-11: Memories Retold launches on PC, Xbox One, and PlayStation 4 November 9. It has a Steam page, but Bandai Namco hasn’t yet provided pricing information on the game or the DLC.